The moment I discovered that "Inanimate Reason" sell Lego-compatible components machined from aluminium, I knew I had to get at least a couple of pieces. If only to gaze upon, and sigh happily. The two long beams are aluminium; the other pieces are standard Lego. As you can see, everything fits. The holes are the right diameter and have the right little rebate around the edges; they're distinctly tighter to push pegs through than standard ABS pieces, but everything works as it should, and axles don't bind. If you're a Lego purist, of course, then it is heresy to use "compatible" pieces of any sort - even Mega Bloks, the best of the usually-woeful Lego clones. It's a sin even worse than gluing pieces together (though probably not as bad as cutting them up). And if you're making something to enter in some sort of Lego contest, then non-Lego parts probably break the rules. 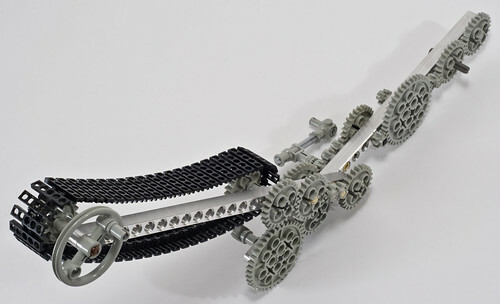 But if all you want to do is make cool things out of Lego, and you need, for instance, some long beams that won't bend as much for robot frame rails or something, these things are great. Inanimate Reason's products aren't even very expensive, by the standards of custom-machined gear. The smaller pieces only cost a few bucks each; my two 25-stud-length, 25-hole "liftarm" beams - the longest Inanimate Reason currently make - were $US11.99 each, plus a modest shipping fee. Besides ordinary beams, they offer a variety of pieces in shapes and/or hole configurations that Lego don't make. You can get curved beams, beams with an even number of holes, holes with varying spacing to allow otherwise-impossible gear arrangements, beams with lockable hinges in the middle, heavy-duty shafting and gears for high-power drive applications, and adapters to let you easily use standard hobby servos in Lego machines. ...but the bendiness of plastic means it can't get anywhere near the somewhat unsettling capabilities of "proper" modern robots. Today, aluminium beams and drive components. Tomorrow, an all-stainless 8880! UPDATE: And now TechnicBricks has alerted me to the existence of Lego-compatible linear actuators, from this company. They integrate a motor and a linear actuator, come in two lengths, and work with both NXT and Power Functions. They're expensive, though; one 100mm actuator costs as much as a whole 8294 Excavator. My jaw dropped when I saw that last vid. Impressive stuff! The purist in me says aluminium Lego is cheating, but the engineer in me says "DO WANT!" I noticed in one of the links some extreme heresy in the form of curved beams. I can see how they claim that such beams don't over-stress 2-stud fittings, but it looks to me that 3-stud fittings must involve some serious bending and friction problems and you are going to have to use multi-grips to remove them. I can understand aluminium though - I had the Auto Chassis 8860 from 1980 and one of the wheel hubs shattered during a... er... speed run down our very steep driveway. The kit was never the same with only three wheels, and I learned that trikes and motorcycle sidecars are inherently unstable no matter what your maths teacher might say about the stability of tripods. A tripod might be stable, but a moving tripod is an accident looking for a place to happen. I still have the cool shock-absorber parts though, which make for cool starship landing struts or mecha legs. « Your worthless fuel pills, or your life!